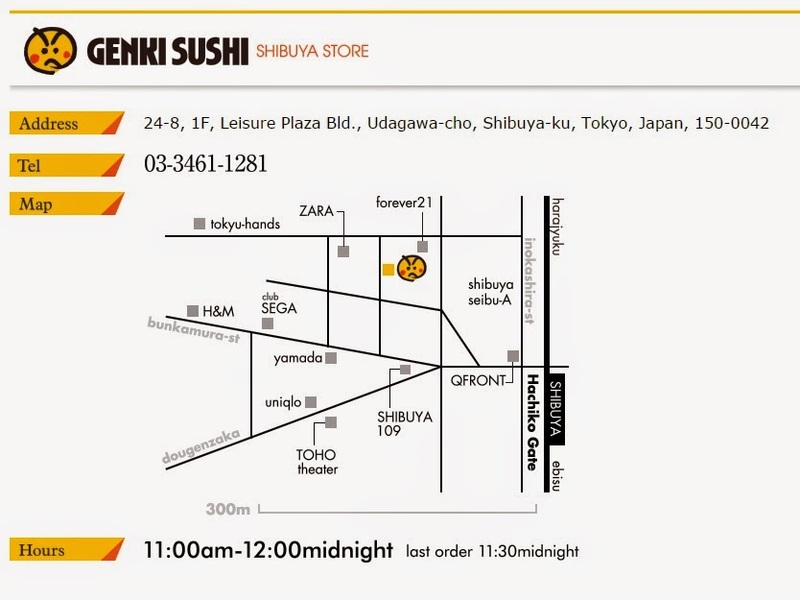 So while I was researching on a good sushi Japanese restaurant to eat at in Tokyo, I came across this famous one called "Genki Sushi" located in Shibuya. I wanted to be able to experience eating authentic sushi made in Japan but I also didn't want to spend too much money either. Genki Sushi was the perfect place as you can eat all the sushi you want from 100 yen to less than 500 yen for a plate. I also saw many blog reviews and youtube videos online and it looked like an interesting place to visit. Genki but not so genki face for the logo of the restaurant, lol. So what makes this place so special and unique other than the cheap sushi? You get to order your sushi from this computer screen and it gets delivered to you on this moving board. It's sort of like those Japanese restaurants with the revolving conveyor belt where the plates come out rotating around in a circle and you have to pick it up. This one actually delivers the plate right to you at your seat. You can also choose to have the sushi with or without wasabi for each plate. And you can choose to sit at the counter seat with the plates delivered to you on a moving board or sit at an actual table where the waitress bring the food to you. Here's a video I recorded at the restaurant. You can also play a paper, rock, scissors game and if you win you can get 20% off your entire bill! Map of how to get to the Shibuya location. It is actually located really close to the Forever 21 store and really easy to find!